After a mere 1,107 posts on this blog, I've moved. The good people at Patheos asked me to blog on their site, and I'm using the change to try something new. Also with several other sociologists who are also Christians. In it, we "share our observations and research and reflect on its meaning for Christian faith and practice." The name of the blog is Black, White, and Gray. While Christianity has some black and white truths, Sociology is very much the study of gray, so it's interesting, and hopefully informative, to bring them together. Here's a post on how Christian love might be swayed by concepts of deservingness. So long blogspot, hello Patheos. I hope that you join me there. Here's an interview with me about the religion in the media, as it appears in getreligion.org. What should journalists watch out for when they report on new religion surveys? What problems do you usually see? I would recommend that journalists read the reports for themselves and see what they find interesting and significant. What often happens is that a large report will contain a small piece of negative, “newsworthy” material, and it’s that piece that gets reported, with much of the rest of the report being ignored. Also, even with that piece, news reports often oversimplify it whereas the report itself will usually (and hopefully) present it in context and with some nuance. Rodney Stark and Byron Johnson have written a provocative essay for the Wall Street Journal. In it, they document the various ways that the media selects "scare" stories about Christianity for publication while ignoring "stay-the-same" or "getting-better" stories. "The national news media yawned over the Baylor Survey's findings that the number of American atheists has remained steady at 4% since 1944, and that church membership has reached an all-time high. But when a study by the Barna Research Group claimed that young people under 30 are deserting the church in droves, it made headlines and newscasts across the nation—even though it was a false alarm." They are right, but, frankly, I don't think that it matters. There is simply too much demand for bad news about Christianity, both by Christians and non-Christians, and so we can expect the media to continue to provide it. Christian Smith has a wonderful op-ed on the Huffington Post. I think we need to reject both sectarian conflict and liberal whateverism and commit ourselves instead to an authentic pluralism. Genuine pluralism fosters a culture that honors rather than isolates and disparages religious difference. It affirms the right of others to believe and practice their faith, not only in their private lives but also in the public square -- while expecting them to allow still others to do the same. Authentic pluralism does not minimize religious differences by saying that "all religions are ultimately the same." That is false and insipid. Pluralism encourages good conversations and arguments across differences, taking them seriously precisely because they are understood to be about important truths, not merely private "opinions." It is possible, authentic pluralism insists, to profoundly disagree with others while at the same time respecting, honoring, and perhaps even loving them. Genuine pluralism suspects the multi-cultural regime's too-easy blanket affirmations of "tolerance" of being patronizing and dismissive. Pluralism, however, also counts atheist Americans as deserving equal public respect, since their beliefs are based as much on a considered faith as are religious views and so should not be automatically denigrated." Despite the quality of his arguments, I'm guessing that the longest-lasting contribution of this piece will be the catchy, and somewhat dismissive, phrase "liberal whateverism." Nicely done. Is religion less important now than it used to be? There are many ways to think of this question. For example, is religion less important in politics, in local communities, in education, in community life, and so forth. However, one critical feature of the importance of religion regards its importance to individual people. This question has been asked more than 50 times over a 25-year period, which gives a sense of how Americans have changed on this issue. In the latest survey, collected in February 2011, 26% of respondents reported that religion is “extremely important to them,” 25% said “very important,” 33% said “somewhat important,” and 14% said “not at all important.” As such, about of Americans experience religion as highly important in their lives (i.e., “extremely” or “very”). About one-third hold it as marginally important (i.e., “somewhat”), and the rest not important. To understand how this has changed over time, I have plotted answers to this survey question over the past 25 years. (I averaged across surveys when multiple surveys asked this question in a given year. Also, this question wasn’t asked in every year). The results are shown in the following figure. 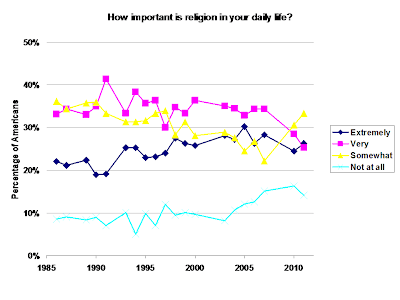 As shown in this figure, the number of Americans who view religion as not at all important in their daily life held steady from 1985 to about 2003 at around 8-9%. Since then, however, it has risen steadily to 14% in 2011. At the other end of the spectrum, the percentage of Americans who view religion as extremely important in their daily lives has also increased. 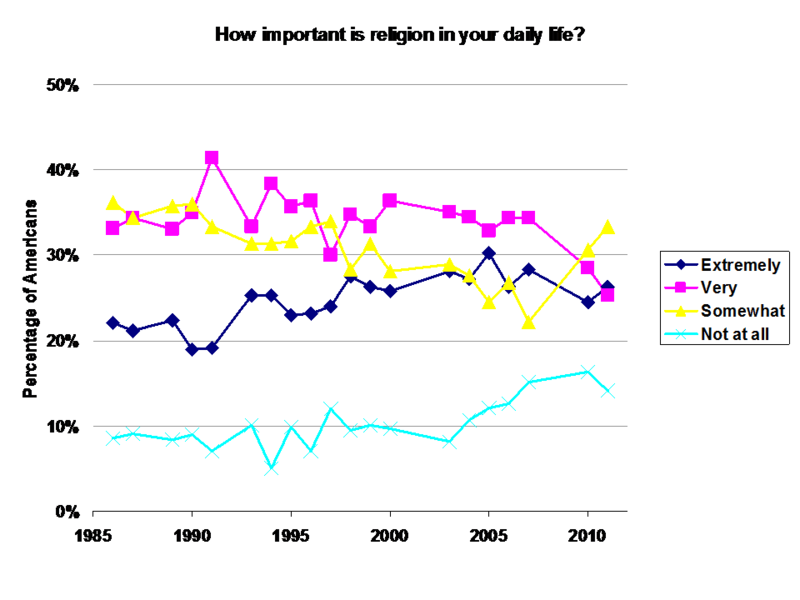 In the 1980s, only 21%-22% of Americans viewed religion as extremely important. This percentage increased steadily over the next to decades, to where it’s now at 26%--a change almost as large as the increase in Americans who view religion as not at all important. Religion as moderately to strongly important. Through 2007, at least, the percentage of Americans who viewed religion as “very” important said steady at about 33%. However, the percentage who viewed it as “somewhat” important dropped, from the most frequently-given answer, 36% in 1986, to only 22% in 2007. In 2010 and 2011, however, the percentage of “very” dropped considerably and the percentage of “somewhat” has risen. It’s too early to tell if this is a robust trend. A more simple examination compares 1986 to 2011. From these data, several trends seem to emerge. 1)	Over the past 25 years, Americans are more polarized regarding the importance of religion. More Americans view it as not at all important in their daily lives, and more Americans view it as extremely important. 2)	For the most part, the increase in viewing religion as not at all important has come at the expense of those who view it as somewhat important. In other words, some of the people who view religion as moderately important as downgrading it to not important at all. 3)	The last two years *may* represent a change in the importance of religion. While the most devout religious people (i.e., “extremely important) hold on to their beliefs, there is a significant drop in those who religion as “very” important, with these people appearing to transition to viewing it as only “somewhat” important. It’s too early to tell, however, whether this is a robust long-term trend. If it is, it could portend further polarization—as the middle ground of religious importance disappears. Here's an interview that I did on 100 Huntley Street, which is one of Canada's top religious programs. Note the white socks... I forgot to pack dress socks. Something that I've learned writing books is that there are lot of Christian radio shows that like to interview authors. It's kind of fun having someone talk with me about my search for 10-60 minutes, and a surprising high number of the hosts seem to have read the book, and they ask rather thoughtful questions. One of the best interviews so far happened last Friday, on the radio show Steve Brown Etc. I'm glad that it went well, because it's broadcast on over 60 stations as well as Sirius/XM. The hosts were funny, insightful, challenging, and complimentary, and it made for a lot of fun. Here's the link for the show, if you would like to listen to it. Cover story in Christianity Today... based on my first book. This month's issue of Christianity Today has an article by me as its cover story. It was both a challenge and a joy to write as it forced me into a bit of a different style of writing, one that I hope is more effective for reaching non-academic types. After 20 years or so of learning to write as boringly as possible, to maximize the chance of getting through peer-review, I'm having to learn some new tricks. Here's the link for the article, and below is the first part of it. Let me know what you think. The actress's 1985 Academy Award acceptance speech is famously quoted as, "You like me! You really like me!" But we often forget that Field was accepting her second Oscar in five years. She had already won the recognition of her peers. What she really said in 1985 was, "I've wanted more than anything to have your respect. The first time I didn't feel it, but this time I feel it, and I can't deny the fact that you like me, right now, you like me!" Similarly, somewhere along the line we evangelical Christians have gotten it into our heads that our neighbors, peers, and most Americans don't like us, and that they like us less every year. I've heard this idea stated in sermons and everyday conversation; I've read it in books and articles. On Monday I posted about how people need to make it small, on their own, before someone comes along to make them big. This gets me thinking about the larger implications of this pattern of business, and I wonder if it will result in greater choice, and thus more interest, among the general population. Here's what I mean. Take books, for example. If it's important to have people already following what you're saying to get a book contract (or at least it helps), this might strike some as unfair. It seems like the old adages of you need money to make money or you need experience to get a job that will give you experience. But, in today's exciting world of the interweb (btw, I still type "www" in front of URLs, just so the computer knows which web I'm talking about), just about anyone can post just about anything. This makes for a much more competitive, open market for ideas. As a result, people who had ideas that previously might have been ignored, and thus effectively stifled, by traditional publishers, can now find a following on their own. Once they have this following, then the traditional publishers will move in quickly. As such, this opens up book publishing (and music recording and inventing) to more people. Also, the increased competition should produce "better" products. I use quotations because I don't mean better in some sort of critical sense, but rather appealing to popular tastes (which, obviously, may not be well-received critically--again, see Rebecca Black). This increased appeal of books, recordings, inventions, and so on should thus increase the size of the market for them, no? Ultimately, the fact that people can initiate their own writing, recording, or business products should increase the amount of sales (in whatever form) for their products. If this line of thinking holds, then the internet should actually increase book reading and music listening and so on. Now, whether traditional book and music companies can make more money is a different question, but they should have more potential customers to court. Last weekend I had a conversation with my neighbor in which he started telling me about a television show called Shark Tank. I haven't seen it (watch little-to-know tv), but apparently entrepreneurs and inventors pitch their ideas to a group of wealthy experts, and then, if things go well, one of the experts chooses to invest in the inventor's idea, making them wealthy. It sounds like Antique Road Show for inventors. According to my friend, the experts aren't just looking for a good idea, but they want a good idea that is already getting some traction in the marketplace, and then they will infuse money and take it big time. Basically, they want to take a small, but growing concern, to the next level, as opposed to taking an idea all the way from the drawing board to a business. This observation interested me because I've heard it in other industries as well. Last summer I spent several days in a recording studio recording a books-on-tape version of my first book. During the breaks (and by the way, that much reading was surprising hard work. I have new respect for voice-over artists! ), I talked with the young guys who owned the studio, and they told the same story. According to them, record labels aren't looking for the most talented singers to make into stars, rather they want people who have already developed a following, and then the label can increase their success. (For a recent example, see Rebecca Black). Likewise, I've heard from several authors, an agent, and an editor that the book publishing world is the same. Publishers prefer authors who already have a big "platform"--basically a group of people who pay attention to what the author is already saying, whether via a blog, sermons, articles, or whatever. This leads me to wonder what it is that I do that can be taken to the next level, with the right amount of money. For a long time it was obvious... with sufficient funding I could have become a spokesperson for Ben and Jerry's! But, now, I've given up the hard stuff, so that's out. I really like presenting social statistics, especially about religion, but it's not clear to me that there's a "big time" for that. So that leaves me with either building stone walls or making smoothies, both of which I've developed quite a reputation for, at least among my immediate family. So, venture capitalists, give me a call! "The good news about bad news is that there is not nearly as much of it to go around as you might think. The bad news about good news is that good news doesn’t tend to sell. Everybody wants to get good news from the doctor and their boss and their (choose one) therapist/stockbroker/fantasy football league commissioner. But it turns out that articles which indicate that the economy should run along OK or that rivers are relatively clean don’t tend to sell newspapers, which means they don’t tend to get writers promoted, which means they don’t tend to get written. People go to conferences that warn about dire situations. People buy books that say the world is falling apart. But living in the information age (or perhaps more accurately the Anxious Information Age), we seem to get bad news more often, on more channels, in high def. For a variety of reasons, folks in the evangelical Christian community are often seem to have a particularly sharp appetite for bad news. Authors and speakers who can document that the younger generation is about to lose their faith, or that churches are about to lose their congregations, or that the nation is about to lose its soul, never seem to run short of listeners no matter how shaky their case may be. The gravitational pull of bad news is a problem. Like the little boy who cried wolf, the purveyors of doom can eventually lose all credibility, so that when bad news really does happen no one is listening anymore. But there is Good News. Bradley Wright has written a terrific book. Brad is an academician, a bona fide believer, and a highly engaging writer. He has a passion for all people—particular for people of faith—to think well and honor the life of the mind and treat statistics with discernment and not to chronically alarmist. He wants to help us quit mistaking negativity with thoughtfulness. He wants to help us stop mindlessly passing on pessimistic diagnoses that either neither helpful nor accurate. He wants us to actually be aware of and celebrate good news that is spreading on multiple fronts. Two thousand years ago, a book began to be widely read whose core was summarized as euaggelion—good news. Not dysaggelion. We, of all people, should be able to recognize and celebrate and express gratitude wherever we find it. For all good news is God’s good news. And to ignore it, hide it, minimize it, or distort it is neither mentally healthy nor spiritually sound. So take a deep breath, turn the page, and get ready to be happy." 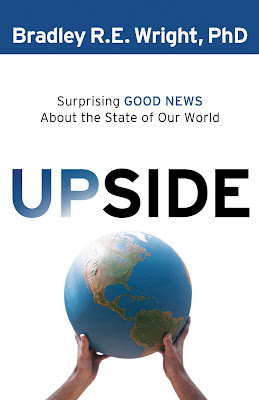 The guiding question for this book is whether the world is getting better or worse. Now, I realize that you’re probably thinking right now that that’s too narrow of a topic, but bear with me, it’s a question worth asking. People with naturally disagree as to whether things are “good” or “bad”, since that involves a value judgment. However, we should all be able to agree as to whether things are getting better or worse; i.e., which direction trends are going. My book develops two paradoxes. One, many, many things in the world are getting better, but most people are convinced that things are getting worse. Two, most people think that their lives are getting better, but their community and nation is getting worse. In my book I explore the reasons for these paradoxes. I finish with examining various explanations for why so many things are getting better, and what we should do in response. Interwoven throughout the book are stories of Christians making a positive difference in the world. These stories range from the actions of individual Christians to Christian organizations, from people feeding the sick to saving the environment. As a quantitative sociologist, I am slowly realizing that sometimes just facts and figures aren't enough to make a case, that sometimes we need specific stories about how things are working to understand the larger picture. These stories highlight all the good things that people are doing in the world, and it has an effect—many things are getting better. We should be encouraged. It seems that our actions to make life better are working, so let’s keep up the good work and do even better! Last night one of my favorite people in the world died. Ervin Tackman was my father-in-law (Cathy’s stepfather), and he was an Iowa farmer, a hard worker, a provider, and a great grandfather. I grew up on the mean streets of suburban Fresno, California (think miles and miles of houses that come in one of four styles), so I had never met an old-school farmer like Erv before, and I learned so much from him, besides the fact that he was an absolute joy to be around. Among other things, he connected me to a different time in America’s history, back when so many Americans worked the land. Erv was raised in the same little valley, a couple of miles from the Mississippi River, that his father, grandfather, and (I think) his great-grandfather had farmed. 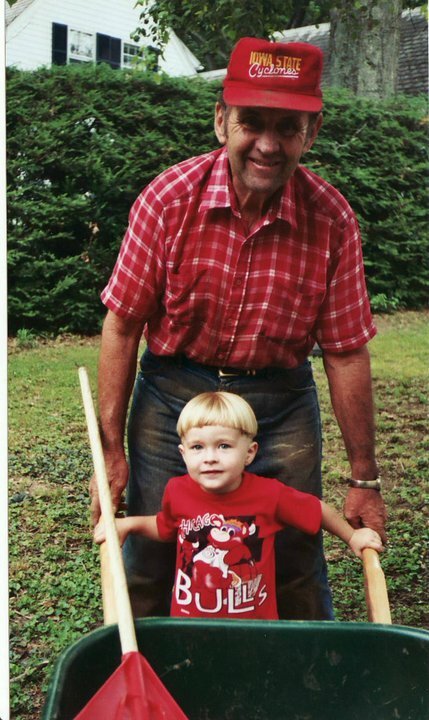 Erv and his family actually used horse and plow to work the land until his teens, when they got their first tractor. Because they raised livestock, hogs, cattle, and at one time milk cows, they had to do “chores” twice a day as well as be available for the occasional livestock emergency. This meant that it was difficult for him to get too far from the house, because he had to be back every day. As such, Erv spent most of his 79 years within a few miles of where he grew up. Erv had many, many good qualities, an easy laugh, a twinkle in his eye, a rock-steady solidness to him, but more than anything, the one thing he was probably best known for was his ability to work hard. Not just a little hard, really hard. More than once he told me that he knew what God had put him on earth for, and that was to work. Not only did he take care of his own acres of land, livestock, and gardens, but he was always ready to help his neighbors and extended family when they wanted it (and, given how well he worked, they wanted it often). Erv grew up working hard, and he never lost his appetite for it. In fact, when he was drafted into the Army in the 1950s, he found boot camp to be so much easier than his daily schedule that he actually gained weight. The first time I shook hands with Erv, I was astonished by how big and strong his hands were. I was a couple inches taller than him, but when we shook hands it might as well have been an adult holding a child’s hand. (Apparently endless typing didn’t give me “ripped” hands). It wasn’t just Erv’s physical capacity for work that impressed me, but it was also his attitude. He never complained, even when things went wrong or people asked him to do things. Once I was with him one late afternoon during harvest season, and he was watching the combine harvest rows and rows of corn. (He would often walk behind the combine and pick up corn that it had missed--might as well do what he could to pitch in). Suddenly, the trailer being towed behind the combine broke an axle, and it dug into the earth, leaning precariously. This meant that he’d be out in the field late into the night, unloading the corn into a new trailer and pulling out and repairing the trailer. If it were me, I would have been pounding the cornfield and cursing the sky, but Erv accepted it without missing a beat. He was always ready to work harder when needed. As he got older, he sold his livestock, which meant he could travel more. This resulted in more trips out to Connecticut to see us. He wouldn’t be here for more than about an hour before he’d politely ask if there was anything he could do to help. When we said “no”, and encouraged him just to relax, he’d try that for a bit, but eventually he’d be out in our yard looking for things needing done. On one trip, he found several stumps from trees that had been cut down, and he knew what to do. He went to the garage and got out an ax, a sledgehammer, and a shovel and proceeded to dig the stumps out (and these were big stumps—several feet across!). It took several days, but he got the job done. On another visit, he was doing some digging and came across a large buried rock in his way (yes, this New England). Me? I would have given up or found another place to dig the hole. Erv? He got a sledgehammer, and he pounded the rock all afternoon until it was small enough to move. (I kept the main remnant of the rock as a fond reminder of him). This event serves as a metaphor for his life—that most problems could be solved with steady, hard work. Erv was also a very skilled worker. His vegetable gardens produced more than anyone else’s. He stacked wood so tight that a chord of his wood was about a chord and a half of someone else’s. At one point, when I was in graduate school, I was grumbling about how long some academic project was taking. (Imagine that, a graduate student complaining!). Although he didn’t know the first thing about what I was doing, he just said that it was okay that I was working so hard on that project because “no one ever sees how much time you put into something.” By this he meant that people just see, and appreciate, the finished product, so you might as well make it as good as possible, regardless of the time it took. This advice, as much as anything I heard in academics, has guided me in my own work. 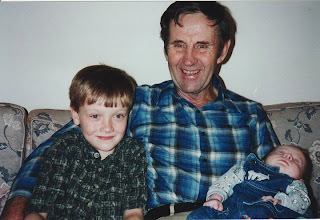 Erv only had an eighth-grade education, whereas I had 25 years of schooling, but there was no doubt that in many ways he was far more intelligent than me. His intelligence was about the physical world, and when he was walking his farmland or the local hills, he was as much a part of them as the rocks or deer or trees. I appreciated Erv’s savvy many times. We he visited us here in Connecticut, I took him for a walk in the woods (and despite his being in his 60s, I had trouble keeping up with him). After about 12 paces, he stopped and remarked at how young the woods were. To me the woods are the woods, but with a practiced eye, he could tell that they were less than a century old by their composition. Erv knew how to live off the land. He remarked once that as long as he had electricity, to run the several freezers in the basement, he could probably live without needing to buy food. He had cold storage rooms full of winter vegetables. He hunted deer for food and trapped otters, beavers, and muskrats for their pelts. He made maple syrup in spring, and in summer collected and sold ginseng. 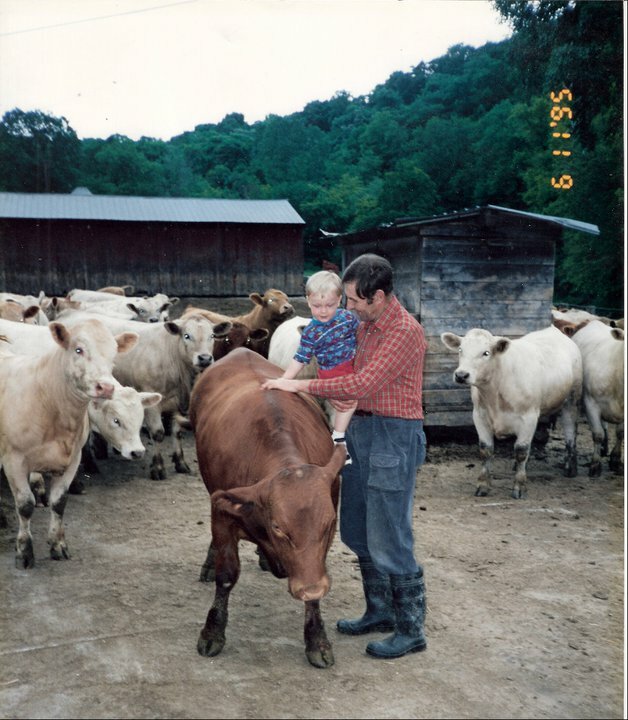 The steaks from his cattle were the best that I’ve ever had (I viewed them as my wife’s dowry). His freezers had many quarts of blackberries and black raspberries that he had picked in the woods, and they were perfect for putting on grandson’s bowls of ice cream (which he sometimes made too). Put Erv down anywhere, and you’d soon be enjoying the fruit of his work. With age and health problems, Erv had to cut back on what he did. One year it was trapping, the next it was his couple acres of sweet corn, and so on. Like so many men, he lost part of himself when he had to stop working. In the end, in his last year he was in an assisted living home, and he liked to be wheeled outside, to the edge of the property on a bluff overlooking the Mississippi, and he would watch and comment on what was going on in what he could see. I, like everyone who knew him, will miss Erv, and I, my wife, and my sons are better people for having known him. Thank you, Erv, and goodbye. 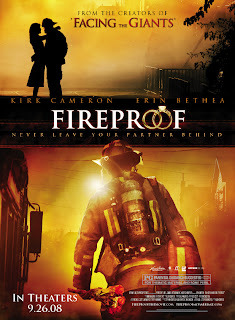 As I wrote about on Friday, I watched the Christian-themed movie Fireproof. It’s a story about a man who finds his marriage in deep trouble, decides to try and save it, and then goes to great lengths to do so. I appreciated the movies portrayal of marriage. Its take-home message is that marriages are really, really important, and that we should put lots of time and effort into making them as good as possible. Furthermore, moral conviction drives our commitment to marriage, above and beyond whatever we happen to be feeling about the marriage or our spouse. The movie ends with the couple reaffirming their marriage vows in a Christian-themed ceremony. This got me to thinking about other, more common themes in the portrayal of marriage in the movies or on television. One theme is along the lines of “my spouse, the hidden monster.” In this plot device, a couple is married for some time and the protagonist discovers hidden, creepy things about who they married. Maybe they have some addiction, or they are secretly a cold-blooded killer, or they are a Yankees fan, or something other nefarious activity. Perhaps more common than that is the “happily ever after” view of marriage. Here movies focus on the various ups and downs of courting, and the big pay-off at the end is the couple getting married. The really interesting, story-telling stuff happens during dating, and marriage is a happily-ever-after state of affairs. A happy marriage is a function of finding the right person, and these movies focus on the ups and downs of doing so. Most commonly, however, are movies that present marriage as a stable backdrop to the important things in life. In these movies, the dramatic tension comes elsewhere—from the protagonists’ work, hobbies, past history, whatever. Marriage is just a form of scenery, in the background giving some context to the characters but not being particularly important in and of itself. Now, I’m not advocating that all films focus on marriage, or that those that do always take a particular viewpoint on it. However, it was very refreshing to watch a movie that held up marriage as important above and beyond the romantic impulses that lead people into it. This fresh take on marriage is probably what made Fireproof a commercial success, grossing more than 30 million dollars (and clearly not costing that much to make). Because it made money, I’m cautiously optimistic that we’ll see more films like it in the future. Last night I watched the movie Fireproof. It came out in 2008, and it’s a story of a fireman whose career is going well but his marriage is falling apart. The movie presents his feelings and efforts as he tries to save his marriage. What makes this movie unique are its explicitly Christian messages. Specifically, at several points in the film a character presents the gospel message to another. Also, the film emphasizes the importance of marriage as a sacred bond, something important above and beyond the feelings of the moment. I’m not much of a film critic, but I would say that in terms of production value, this movie is better than a Lifetime channel movie but not up to the standards of a big-budget Hollywood film. It stars former child-star Kirk Cameron, who did a credible job as the lead, and much—but not all—of the film was believable. I woke up this morning thinking about several aspects of the film, or, more accurately, my reaction to it. The thing that surprised me the most was that I found myself a bit uncomfortable with the gospel-presentation scenes. It’s not that they were done badly nor did I disagree with their message in any way. Rather, I found myself cringing at how openly the movie presented the gospel. I watched it on the computer, and during those scenes I wanted to check my e-mail or read the newspaper headlines. For whatever reason, whether it’s because of my being in academics, a less-religious part of the country, or whatever, I’ve inadvertently bought into a peculiar view of the appropriateness of talking about the gospel with other people. Namely, it’s violating a social norm—something not to be done. As I experience it, the norm about talking about religious beliefs goes something like this. It’s okay to have your own beliefs, even to hold them strongly. It’s also okay to discreetly acknowledge your affiliation with a particular set of beliefs. However, if you’re going to talk about your religious beliefs openly, you should do so with someone who shares your beliefs. It’s probably not appropriate to talk about them with people who don’t already agree with them. As Stephen Carter wrote about it in The Culture of Disbelief, the message is that Christian faith should be kept almost as a hobby—fine if you do it at home, but don’t bring it into the public sphere. My squirming at the gospel message in Fireproof may just reflect that I squirm at a lot of things, but I think it also results from me having partially bought into the “don’t ask, don’t tell” view of the Christian message. Now, I realize that this can be taken too far the other direction, and people can become obnoxious bores with the gospel (or anything else for that matter), but that’s not what I’m talking about here. So, I guess that my goal is to talk about my religious convictions as freely as I talk about other things that I care about or am thinking about, such as bicycling, gardening, or In-N-Out hamburgers (though, that last one may put me into obnoxious territory). I was teaching today about the culture of fear hypothesis, and a student gave this commercial as an example. When she described it, I actually didn't believe her, but as usually happens, truth is stranger than lecture. Our seventeen-year-old, Gus, graduated from high school this week, so we had the traditional end-of-the-year pool party, and went to his graduation. All good and proper. My favorite moment, though, was learning how he celebrated the last day of class. After getting up way to early for four long years (class starts at 7:20), on his first day done, Gus set his alarm for the usual 6 am. He did this so that he could turn it off and go back to sleep for the rest of the morning, something he's been wanting to do for some time. He's taking a year off to work (save up money) and travel (spend money). In fall 2012, he'll attend Wheaton College. One of my life goals--believe it or not--is to play more jokes on people. I used to all the time, but somewhere along the line I kind of got boring; hence my renewed commitment to silliness. As this video shows, really funny jokes can be simple and playful. Years ago, an undergraduate student and I published a meta-analysis of this literature, and we found an overall negative correlation between religion on crime. (I.e., religious involvement and affiliation corresponded with less criminal behavior). I haven't done much in the area since, and clearly this book is the definitive statement on research on this area. (Also, it's a great book-support site). Some interesting ideas, in a compelling video, from Stephen Johnson.